Between 1889 and 1892, he studied at the Pennsylvania Academy of Fine Arts before, in late 1892, going to Paris, where he enrolled at Julian’s Academy, studying under Bouguereau, Ferrier, Aman-Jean and Doucet. During his three years in Paris, he travelled to Fontainebleau and Brittany and was fired with enthusiasm for Impressionism. Schofield was primarily a landscape painter, and this was the period when the landscape and marine work of the St Ives artists Arnesby Brown, Julius Olsson, Algernon Talmage, Noble Barlow and Arthur Meade was winning high plaudits at the Royal Academy. There is little doubt that Schofield was influenced by the plein-air approach of these artists, and he adopted a broader view and lighter palette. Commenting to his friend, C.Lewis Hind, on his new found enthusiam, he stated, “Zero weather, rain, falling snow, wind - all of these things to contend with only make the open-air painter love the fight...He is an open-air man, wholesome, healthy, hearty, and his art, sane and straightforward, reflects his temperament.” In addition, Schofield started to use huge canvases for his outdoor works, and the result was panoramic landscapes, boldly and expansively painted. Schofield was a restless spirit. No sooner had he settled into any new home that Muriel had located for the family than he would announce “Well, it’s time to be moving on.” And he developed a lifestyle that involved him spending as much as six months a year - normally from October to April - in the States away from his family. 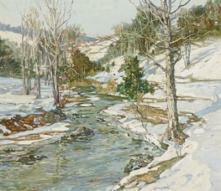 Schofield always favoured the American exhibition circuit and American patrons and, as a result, during the first three decades of the twentieth century, he became regarded as one of America’s leading landscape painters and is now lauded as one of the most important of the American Impressionists. His medal tally at American and International exhibitions is impressive and include a ‘Mention Honorable’ at the Paris Salon in 1900, a First Class Medal at the Carnegie Institute in 1904, a Gold Medal at the 1910 Buenos Aires Exhibition, the Medal of Honour from the Panama-Pacific International Exposition in San Francisco in 1915 and a silver medal at the Corcoran Gallery of Art, Washington D.C. in 1926. In fact, the Corcoran held three one-man exhibitions of his work in 1912, 1920 and 1931 and he was well-respected in art circles, serving on exhibition juries and selection committees. Schofield made more than forty crossings of the Atlantic by steamer, and, between 1902 and 1937, the only years when he did not visit the States were the War years. In 1915, aged 48, Schofield felt so deeply about Germany’s actions that he enlisted as a private soldier in the Royal Fusiliers but, with Olsson’s assistance, he received a commission from the Royal Artillery the following year. He fought at the Somme and rose to the rank of Major but his only painting exploits were in camouflaging the guns under his command. In 1921, he returned to Cornwall, living at Doreen Cottage at Perranporth for four years, although, as always, he was constantly away from home, seeking new subjects, new inspiration and, most importantly, new purchasers. In 1925, the family moved to Otley, Suffolk, where his son, Sidney had started farming. In the late 1920s and 1930s, with his marriage under strain, Schofield spent as much as nine months a year in the States and, in addition to returning as always to his home state of Pennsylvania, he spent long periods in California, Arizona and New Mexico, where he painted scenes of the American West. However, when his son, Sidney, in 1937, purchased Godolphin House, the impressive manor dating from the 15th century, near Helston, he could not resist the lure of Cornwall again, and he and his wife moved in during the autumn of 1938. He immediately joined the St Ives Society of Artists - Moffat Lindner, Fred Milner and Arthur Meade would have been colleagues from his first visit to St Ives - and his exhibits soon were highly applauded. In 1941, after his son’s marriage, he moved to Gwedna House, a smaller residence on the estate, where he died from a heart attack in 1944.